I’ve been thinking about moving. I love my house, but its just a bit small in some areas. My living room is tiny and the bedrooms my kids share are busting at the seams. Its not that we have a ton of junk either, we are just “real sized” people. Not those “fun sized” persons you see on television or at the mini golf course, we are all very real, life-sized people. We take up a lot of room just ‘being’ in the room. 1. Storage. Again, it isn’t because we have a lot of junk, its because I like to can and store and collect very useful things that I may or may not ever need. Don’t judge me til you clean out that junk drawer…. 2. Windows. I know it seems like a given, but there are some houses that simply don’t have enough light in them. This could be beneficial if you are a vampire, mold, or anti-social-midnight-internet-surfer-dude. For me, I like sunshine and lots of it. Even in the dang desert of Az. 3. A “not Stupid kitchen.” Yes, there is a story here. I spend a lot of time in the kitchen and I can’t abide in a home that has a kitchen with those pointless little cupboards that house…..dust? I also require a dishwasher, refrigerator, and working sink. I know…little miss princess. Whatever. 4. A Big Yard. I know I don’t have any actual proof of being a master gardener, other than the 27 eggplant I successfully grew last fall….but I feel it in my slightly tinged green thumbs that I have the potential for great green goodness if I only had a yard big enough to explore my gift in. It doesn’t have to be ‘country’ sized, but I would like at least an acre. 5. No HOA. This one may be a lost cause as it seems every house in town has one of these evil empires ruling it, but I can dream. So far, all I can conclude the HOA does is Harrass, Overlook, and Add to my irritation. They refuse to fix anything on THEIR responsibility list but can see a single week in my yard from across town. If it bothers them so much, why don’t they pick the darn thing!? 6. A living room big enough for a baby grand piano. Yes, I know I don’t actually OWN a baby grand…yet….but I’d like to have room for one if something amazing happens and a truck pulls up to deliver one at my house. I used to have a big baby grand….way back in the day, and I loved it! But alas, Brad refused to move it when we moved so I sold it…for a small profit. I love my piano now but….baby grands are so…grand! 7. Painted walls. I know, you’re thinking this is another given. I think you may have forgotten about the 7th evil in the world. Right after hot dogs comes wallpaper. I hate wall paper. I have wall paper in my house now and it hasn’t driven me crazy, but I think its just because I’ve gotten too lazy to rip it down. I have ripped wall paper off many a wall….its evil. 8. A city it lives in. Back when Brad and I were dating and newlywed, we used to dream about the day when we would live out on a farm in a small nowhere town. We would live off the land and enjoy the peace and quiet of country life. In 94 we moved to ‘Nowhere, USA’ and lived the dream for 9 very long months. We decided we absolutely HAD to have a blockbuster within 5 miles, and a store that sold ice cream for under $7 a half gallon. We never looked back. I may want land, but I want it down the street from the Fresh and Easy … not hidden in the woods (desert). 9. A Basement. Okay, this isn’t a ‘must’ but it would be cool. Literally. Anything that would keep the electric bill down in the summer would be a definite plus in my book! 10. The last thing my house must have is ‘no wheels.’ I lived in several mobile homes in my youth. I did my time. Nothing against the wonderful people that currently live in mobile homes, unless you live in Alabama….or Florida….seriously? 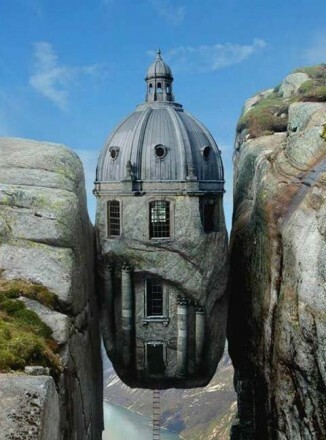 I just don’t like feeling my house rock me to sleep in a wind storm. I like my feet firmly on the ground….or carpet, or wood, or tile…..cause I said so. This entry was posted in Beckie and tagged building, carpet, case, castles, house, mobile home, moving, tile, wood. Bookmark the permalink.